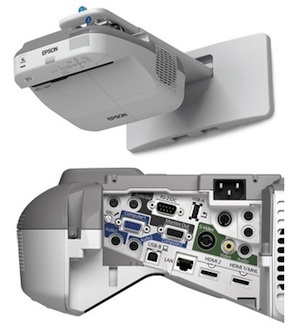 Epson is hosting a contest that will award interactive LCD projectors to educators. The Epson BrightLink 595Wi supports touch-based interactivity for as many as six simultaneous users. The Epson BrightLink Projector Teacher Contest calls on classroom instructors to "share three creative ways to engage students in the classroom using an interactive projector." Three winners will receive an Epson BrightLink 595Wi, an LCD-based projector that offers WXGA resolution (1,280 x 800) and that can be mounted as close as 12.2 inches from the projection screen (producing a 100-inch image). The 595Wi offers a brightness rating of 3,300 lumens. The unit is designed to be used in conjunction with classroom devices, including student devices like iPhones, iPads and Android-powered tablets and phones. With the use of EasyMP software, the projectors can display content from these devices (as well as document cameras, PCs, DVD players and other devices) wirelessly. Multiple devices can be displayed simultaneously. The 595Wi is interactive and supports dual pen input. It's also touch-enabled, allowing teachers and students to annotate on projected images using just their fingers. Up to six users can annotate simultaneously. The projector also supports gestures. AV ports include dual HDMI, RGB (mini D-sub 15-pin), S-video, composite video and three minijacks. Networking and control ports include wired LAN (RJ-45), USB-A, USB-B and RS-232C. The entry period for the contest runs Feb. 5 through April 15. Entries can be submitted online at epson.com/brightlinkcontest.